Following protests from activists, textbook publisher McGraw-Hill announced earlier this month that it was withdrawing and planned to destroy a political science textbook, Global Politics: Engaging a Complex World. 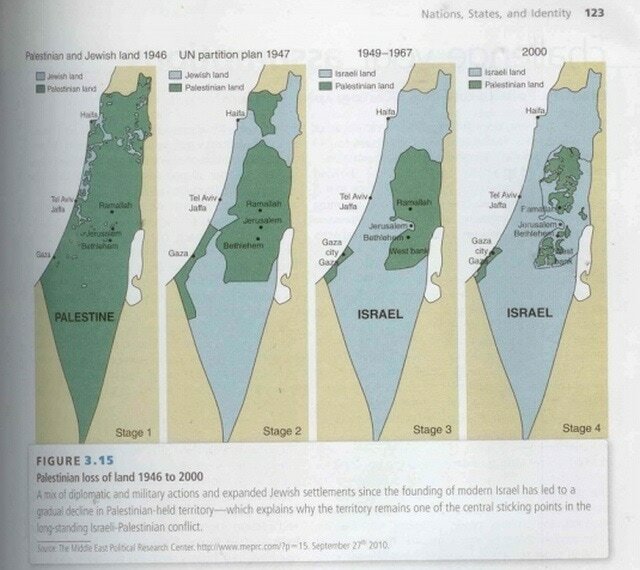 The college textbook was criticized for its use of a set of a set of four maps of what is now Israel, the Gaza Strip, and the West Bank which were described in the caption as depicting the "Palestinian loss of land" from 1946 to 2000. You can see the maps below, and I will explain a few of the disputed details in a comment on this post. Catherine Mathis, a spokesperson for McGraw-Hill, told Inside Higher Ed via email, "As soon as we learned about the concerns with it, we placed sales of the book on hold and immediately initiated an academic review. The review determined that the map did not meet our academic standards. We have informed the authors and we are no longer selling the book. All existing inventory will be destroyed. We apologize and will refund payment to anyone who returns the book." Maps are funny in that changing or removing the most subtle details can often bias the viewer. Placing a particular country in the center of the map creates the impression that it is the most important, and automatically orienting the map so north is up can have a similar effect. Similarly, leaving parts of a map unlabeled creates the false impression that no territory or political unit exists in that part of the map (keep this in mind the next time you view a map of the ancient world). The publisher did not explain how the map was chosen, merely noting that it had been submitted by the authors. The authors of this work were Natalie Hudson, associate professor of political science at the University of Dayton; Mark Boyer, professor of geography at the University of Connecticut; and Michael Butler, associate professor of political science at Clark University in Worcester, Massachusetts. They didn't respond to requests for comment. This story brings to mind a similar incident from last year where McGraw-Hill withdrew a Texas high school history textbook for its description of the slave trade as having "brought millions of workers from Africa to the Southern United States to work on agricultural plantations". I can spot three obvious problems with the maps. In the third map, what is described as Palestinian territory (Giza, West Bank) is actually controlled by Egypt and and Jordan. (The latter had in fact annexed the West Bank.) The second map shows the proposed partition which was never accepted, and thusnever existed. And the first map misleads the viewer in that it shows dots of land privately owned by Jewish Palestinians while neglecting to inform us that 93% of the land in that territory was owned by the gov’t (that is still true today). So the solid swath of green is not an accurate representation. There is the fourth problem that the theme of “jewish” and “Palestinian” territory makes it seem as if there arab palestinians in “jewish” territory and that there were few if any jews in palestine originally. Both are false. It also conflates political labels–palestine is a geographical and political label, it was not an ethnic label until recently. Palestine was simply the name of a region where jews, arabs, berbers, and other ethnicities lived. When the jewish state was declared (jews had been promised a state by the “great powers”, who reneged after the war), a vast number of the non-jewish residents of the region chose to leave (fearing the impending regional war and for other, religious reasons) while jews in the arab-controlled states moved in (many voluntarily, others because they were expelled). The territory controlled by the jews was, as shown in the proposed partition plan, small. It grew with the successive attacks of the arab-controlled states as each war ended in arab retreats. The whole story is a mess with no heroes, no villains, few innocents, and lots and lots of victims. The main takeaway is that maps need to be clearly labeled as to what they seek to portray; political boundaries, ethnic distribution, etc. And they need to be accurate. Those maps aren’t and the sequence itself seems designed more to deliver a political narrative of dispossession than the complex realities of what actually happened. That such a thing sailed through editing and hit the market with no questions asked, much like the other recent issues, raises plenty of questions about the publishers motives and/or competence. Neither slavery nor the palestinian “issues” are low profile matters. They are both known to be controversial minefields, yet the industry professionals stumble right in like rank amateurs. Over and over. Makes you wonder who is running the show.